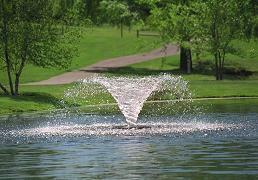 The 2400VFX floating aerating fountain is a classic design great for residential applications or small farm ponds. The classic Kasco V pattern, 5′ Tall x 15′ wide will improve water quality and aesthetics of any pond. The 2400VFX includes a control box, the C-25, 120V control with timer, GFCI protection, and photo eye for light operation. No electrician is required to install the C-25 Control or the 2400VFX if an existing 120V, 15 amp receptacle is available. Add an optional Fountain Lighting Package to the 2400VFX to extend its beauty into the nighttime hours.